In the early 1900’s, you could find James Galligan moving through the streets of Philadelphia behind his pushcart carrying his tools on the way to another plumbing repair. Today, his grandsons are still in the trade and working hard within Pipeshark to solve piping problems with the newest technologies. Technologies which can install and repair buried or otherwise inaccessible piping without all the damage, inconvenience and restoration that accompanies digging things up or ripping things out the traditional way. We grew up in the mechanical contracting trade, specializing in difficult mechanical problems and design-build projects, ranging from the old (steam) to the new (medical oxygen). While searching for a way to repair a broken sewer line running under an institution’s historic tree we were referred to a former Doylestown, PA native living in California who was inventing a method of replace buried piping by breaking it up right in place underground and then replacing it with a remarkable new piping, all in one operation, and with only minimal excavation. We bought his equipment to replace the sewer and saved the tree. At that moment as we looked back over the collective memories of three generations of destroying and breaking things just to get to the problem to be fixed, we feel in love with this new device. From that point on we have embraced, lobbied for, and even helped advance technologies designed to install, repair, or replace piping and conduits which run under, above, or behind things people want to preserve. 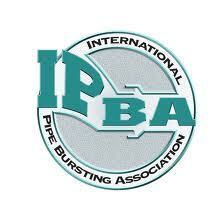 Now, besides pipe bursting, we also do pipe lining, pipe boring, and slip lining. We are constantly learning to do more and harm less. 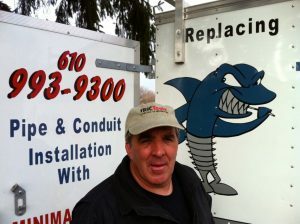 We created Pipeshark to aggressively pursue using these new technologies and become experts in trenchless work. Most of our clients are in Eastern Pennsylvania but we often travel much further to do work because of our equipment and experience. Frequently, we’re called into work with a local contractor or a municipality who have a lot of the traditional experience and equipment and just needs our special experience and equipment to complete their team on a project. For example, we recently assisted a local contractor in the Washington, DC area to replace ten different sections of sewer mains, and we worked with another on an Army Depot under the US Army Corps of Engineers to replace a forced sewer main running under some roads and railroad tracks. Locally we do a lot of work with plumbers on residential sewer and water lines and we also do a lot of work directly for homeowners and building owners. We are master plumbers and are registered in Pennsylvania under the Home Improvement Consumer Protection Act (HIC # is PA021884). 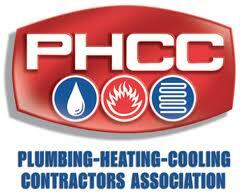 We are also members of the Plumbing Heating Cooling Contractors Association (PHCC), the Better Business Bureau (BBB), the National Association of Sewer Service Companies (NASSCO), and the International Pipe Bursting Association (IPBA).